Saturnade is a Sega Saturn homebrew game inspired by a popular game featuring an avian flapping its wings to pass through the opening between vertical pipes. 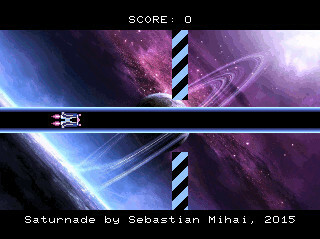 In Saturnade, the concept is reversed a bit, in that the player controls the opening, rather than the ship. If the opening gets too close to the bottom of the screen, it will "snap" back and reappear at the top. This is so that the game is not trivialized by waiting for the opening to "land" at the bottom, and then work it upwards from there. The starting point for this game was a tic-tac-toe source code which was a jumble of spaghetti code, with a nasty sauce of an SDL-like wrapper on top. The first few evenings were spent only on cleaning that up, and extracting useful bits. dev kit - get this if you wish to compile Saturnade yourself, or if you'd like to develop your own games using this as a starting point! Tested in Windows XP. See instructions below. - installer will install it in C:\SaturnOrbit\ (it's required to be installed there). Select at least select one of the two supplied compiler toolchains (COFF, ELF). Windows 9x users must select the Win9x support.